Storing in oil is a traditional method that probably dates back to the beginnings of civilisation when man discovered olive oil in the fertile crescent of the Mediterranean. 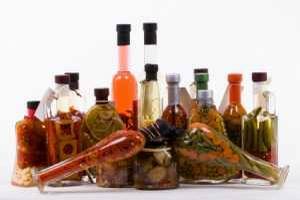 Nowadays it is used more often as a way of producing flavoured oil than an actual storage method and the main vegetables used are garlic, chilli peppers and dried tomatoes. Not only can you use the produce, the flavoured oil can be used for salad dressing or in cooking. The theory is quite simple, the produce is covered in the oil, which excludes air so preventing the growth of spoiling organisms. It is recommended to heat oils, especially with chillies and garlic as they can harbour botulism spores, to around 140ºC/285ºF before pouring into the jar/bottle. This also has the benefit of speeding up the infusion. Alternatively use dried chillies – it is the moisture in fresh chillies (and garlic) that can, possibly, allow botulism to develop. Use an oil that doesn’t have a strong flavour, it will be overwhelmed by the garlic or chilli flavour anyway. A good quality olive oil is fine, you don’t need to pay the premium for extra virgin, or even just sunflower oil. Prepare the contents, de-seeding washing and thoroughly drying peppers before slicing into strips or removing the paper from garlic cloves, slicing the larger cloves lengthways in half. Sterilise washed clean jars and lids by heating in a low oven for ten minutes or more, this will drive out any moisture and heat the jars so they do not shatter under thermal shock when you add the hot oil. Place the contents into the jar, ensuring they are first dry and then pour on oil that has been heated to 140°C (285°F) or higher – This has the same effect as the commercial canning botulinum cook of 121°C (250°F) for three minutes. Seal the jar, ensuring it is airtight. Keep in a dark cupboard for up to four months, after this they begin to lose flavour. After opening the jar should be kept in a fridge and the contents used within two weeks. If using corks, they should be new and boiled for 10 minutes or kept submerged in boiling water for 15 minutes before use. This not only sterilizes them but makes them easier to push into the bottle. Screw tops also benefit from sterilizing in this manner. NB Herbs are best picked just before they come into flower, early in the morning before the sun gets too strong but not after it has rained.